Trailer storage solutions and organization is a hot topic for a lot of recreational vehicle enthusiasts. We have owned 3 trailers in the past 10 years and with each trailer I have made it my goal to get the best use of space out of each nook and cranny. 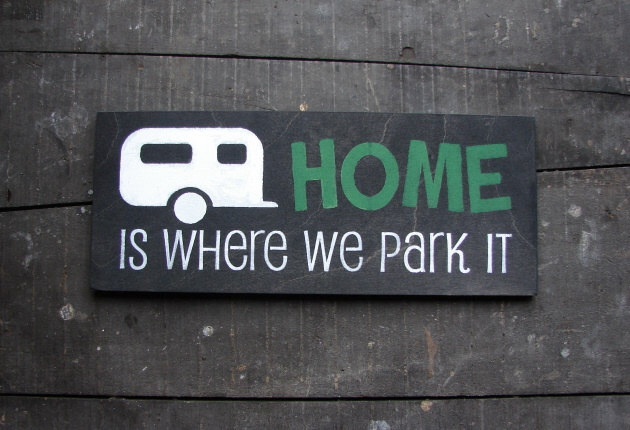 So much so that my camping friends have – let’s say – noticed! With our newest trailer we are very fortunate to have lots of cupboards and storage areas. 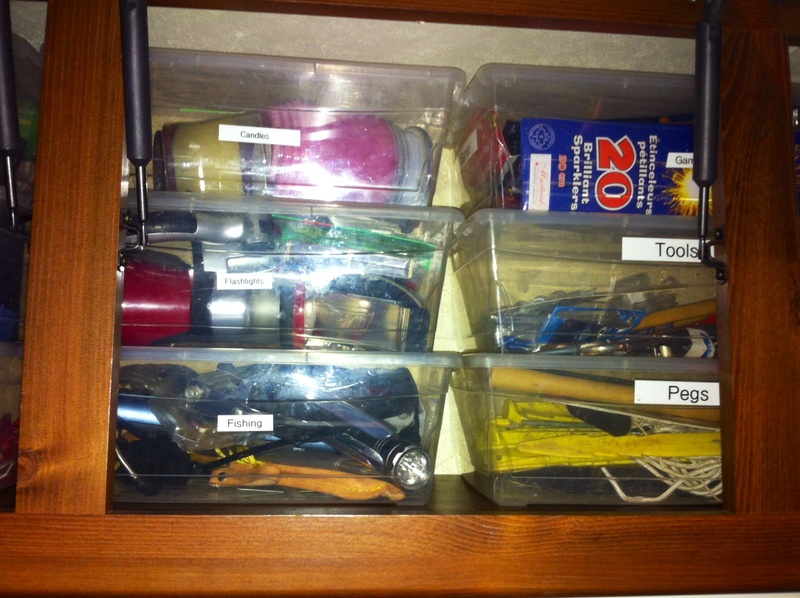 The combination of storage areas and my experiences with our previous trailers has made organizing this trailer simple. My favourite storage solution is, hands-down, clear plastic shoe boxes. My heart skips a beat when I think of them used in combination with a labeller! So, how do I use shoe boxes in my organization obsession? Well, here is a prime example. The cupboards, in the above picture, are above our kitchen dinette. The area is awkward to access, as you have to climb on the benches to reach the cupboards. So, it required some sort of tote storage system. The shoe box solution helps keep like items grouped together. The labels eliminates the “I don’t know where it goes” argument for not putting things away where they are supposed to go. The shoe boxes are sturdy – we have had these ones for about 3 years now and I think one lid cracked (from misuse). 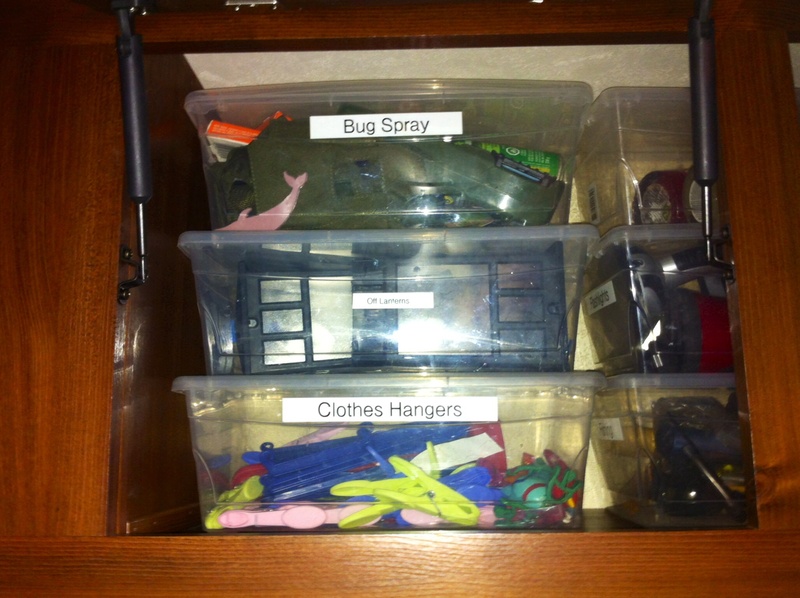 Not only do I store gear and knickknacks in them, but I also use them for storing food, kids toys, clothes, etc. They have been the best storage solution purchase that we have ever made. Go out and buy some! You’ll thank me later! 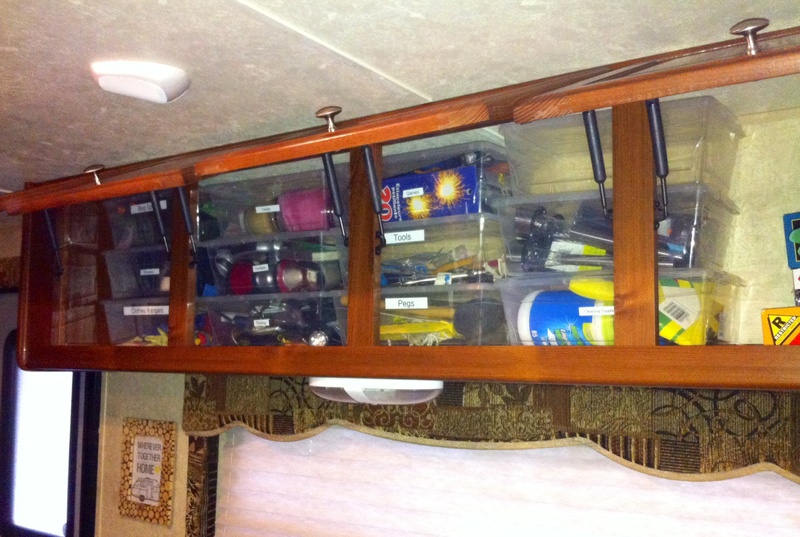 This entry was posted in Trailer Organization, Modifications & Storage Solutions and tagged Camping, Must-Have, Organization, Plastic Shoe Boxes, recreational vehicle enthusiasts, RV, Shoe Box, Storage, storage areas, storage bins, Storage Solution, Storage Solutions, Trailer storage solutions, Travel Trailer. Bookmark the permalink. I purchased the shoe boxes at Canadian Tire a few years back, but I was there today and they still sell them. I believe the price went up a tad since I originally purchased them though. What campground are you staying at in the Parks of The St. Lawrence, if you don’t mind me asking. We are seasonal there this year. Hoople Island perhaps? It’s a new camping development and it looks like it offers enough privacy. We are about 5 minutes away at Farran’s. We used to camp at the Bird Sanctuary often enough. It’s very tranquil there. Perhaps we have crossed camping paths at one point or another! Probably! I am not in front of our itinerary at the moment. We liked the idea of one night on our road trip of off-grid camping. The rest of the time we are basically hauling our condo with us 🙂 Last year was our first time at the bird sanctuary and we thought it was wonderful. Wouldn’t that be funny if we’d crossed paths! Well, we lead awfully similar camping lives! Anything is possible! Oh and congrats on the new trailer and the new adventures! It’s always so exciting picking up the new trailer!